A couple years ago, the Red Sox farm system was chock-full of talented position players. But things went according to plan and much of that young talent is in the Majors, leaving the Minors a little lacking. Michael Chavis, MLB.com's No. 79 overall prospect, excelled at the plate in recent years but is coming off a 2018 season in which he was suspended 80 games for a performance-enhancing drug violation and was limited to 46 games in general. He's likely to get more time at first base as he gets closer to the Majors, putting an extra emphasis on his need to hit. Bobby Dalbec and Triston Casas also provide strength at the corners, but the former has major contact issues and the latter is still likely three years from The Show after being selected out of high school in last June's Draft. Beyond those three, the system falls off quite a bit, highlighting Boston's need to keep this Major League core intact for as long as possible. There are a lot of big names in the Tigers system right now, but they're pretty much all pitchers. Outside those hurlers, Detroit's top prospects are anchored by outfielders Christin Stewart, Parker Meadows and Daz Cameron, all of whom grade out as average. A bright spot could be shortstops Isaac Paredes and Willi Castro, who both posted promising numbers with Double-A Erie last season, while teammate Jake Rogers continued to flash his skills as a a defense-first catcher with some pop. Like the Tigers, the Cubs feature more pitchers at the top than position players. High-ceiling prospects Miguel Amaya and Aramis Ademan haven't quite taken off at the playe yet, though the former's potential is mostly found behind the plate. Shortstop Nico Hoerner advanced quickly after being selected 24th overall in last June's Draft, but a torn ligament in his elbow cut his season short at 14 games, so this year will be his first real Minor League showcase. He did impress in the Arizona Fall League, so it'll be interesting to see how MLB.com's No. 100 prospect can carry his plus bat over a longer campaign. Outfielder Brennen Davis features well-above-average speed but hasn't put it on display just yet, following his second-round selection. Last year's edition of these rankings placed the Yankees at No. 3 overall, but with Gleyber Torres and Miguel Andujar graduating, the system took a serious hit. Their current saving grace, though, is Estevan Florial. The club's top prospect has plus speed and could be an above-average outfielder, if everything works out. Although hamate surgery cost him two months, Florial posted better numbers after returning from the disabled list than he did at the start of the season. The 21-year-old will look to be more consistent this year, especially when it comes to contact rate. The Yankees hope versatile infielder Thairo Estrada can get back on track after a gunshot wound and an unrelated back injury held him to 18 games in 2018. Catchers Anthony Seigler and Josh Breaux, plus outfielders Everson Pereira and Ryder Green could provide some oomph one day, but it's still very early as they are all coming off their first pro seasons. The A's position player grabbing the most headlines might not even play a single professional inning. With Kyler Murray entering the NFL Draft, the system won't be nearly as enthralling should he wind up choosing football. Sean Murphy, with his well-above-average arm, is considered the fourth-best catcher in the Minors. Behind him are outfielders Austin Beck and Lazaro Armenteros, who both patrolled the grass in Class A Beloit last season and grade out as slightly above average. Shortstop Jorge Mateo was a key name in the Sonny Gray trade back in 2017 but hasn't carried the hype from his New York days into his first full season with Oakland. With Derek Jeter at the helm, the Marlins have made a few moves over the past year to try and put together a solid farm system, most recently bolstering their pitching crop as Sixto Sanchez joined the fold last Thursday. The biggest move involving a position player was signing Victor Victor Mesa, a speedy outfielder dubbed the top international player in the 2018-19 signing period. Monte Harrison, who they acquired just over a year ago, can also rack up the stolen bases while showcasing a plus-plus arm in center. Isan Diaz rounds out the most notable Fish, but he still has room for improvement on both sides of the ball as he gets comfortable at the Minors' highest level. Like the Yankees, the Phillies also slipped many spots from last year with Scott Kingery and J.P. Crawford graduating. But Philadelphia has positioned itself to pick up the slack through recent Drafts and signings. Third baseman Alec Bohm and shortstop Luis Garcia showed a lot of promise in their first pro seasons -- the latter hit .369 in 43 games -- but fans will need to wait and see how that translates to full-season ball. First-rounders Mickey Moniak and Adam Haseley could have tools across the board but have fallen out of the Top 100 in recent years. Nolan Jones powered his way to Class A Advanced as his bat got stronger after the jump from Class A, though he could stand to cut down on his strikeouts. Shortstops Brayan Rocchio and Tyler Freeman saw their stocks rise as they both hit well above .300 in short-season ball. With his older brother, Josh, climbing the San Diego system, Bo Naylor is making a name for himself with Cleveland. The 2018 first-rounder found his footing in August with the Rookie-level Indians, showing potential both at and behind the plate. Bobby Bradley is the closest Indians prospect to The Show, thanks to his plus power, but questions about his glove and overall hit tool could hold him back. Jerry Dipoto did Jerry Dipoto things and picked up four position players this offseason in outfielders Jarred Kelenic, Dom Thompson-Williams and Jake Fraley and second baseman Shed Long. Kelenic -- the Mets' first-rounder last June -- is the biggest piece as a pure, left-handed bat and a plus arm. Mariners past first-rounders Kyle Lewis and Evan White both finished the season on high notes, making August their most productive month of the campaign. 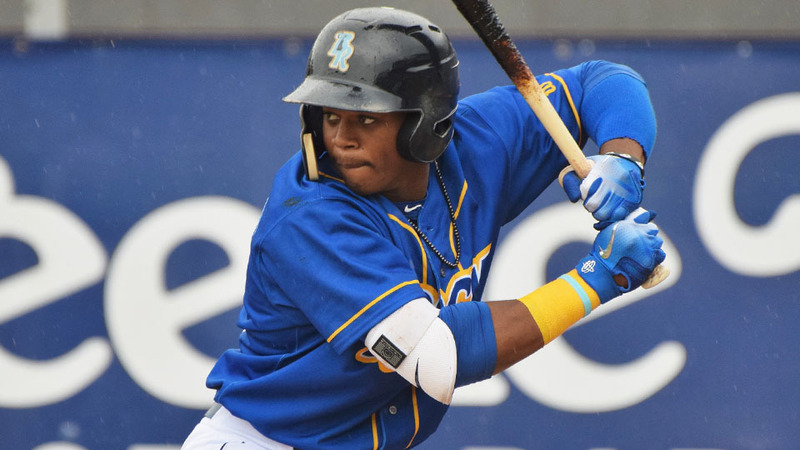 Notable outfielder Julio Rodriguez raked in the Dominican Summer League, showcasing all five tools, but time will tell if his tools can translate at the next level. His growth, along with Kelenic's ability to showcase his potential over a full season, could give the system some added helium this summer. The Royals have an exciting crop of left-handed hitters, starting with Khalil Lee. The 20-year-old outfielder advanced to Double-A last season, but his campaign was cut a month short with back soreness. Lee then worked on his plate discipline as he ended the year in the Arizona Fall League. Fellow lefty Nicky Lopez proved to be one of the farm system's best hitters, finishing the year at Triple-A, while Kyle Isbel also had a strong showing at the lower levels. Catcher MJ Melendez and infielder Nick Pratto both made strides as the season went on with Class A Lexington. From the other side of the plate, Seuly Matias led the entire organization (including the big club) with 31 homers, but strikeouts remain a problem. MLB.com may not have ranked a Royals position player among its Top 100 entering 2019, but the depth in this system pushes the group past the others on this list.